Healthcare companies are using artificial intelligence and machine learning, and then the cloud to better ingest, manage and leverage a variety of data – whether it is structured data, unstructured data or streams, to break down silos and enable data liquidity in support of collaborative research and care coordination. For instance, Orion Health hosts data for 50 million users on the AWS Cloud, enabling its customers to access patient information ranging from clinical information and genomics to claims and reimbursement data, Partovi added. In turn, providers can identify personalized treatment and prevention strategies and optimize clinical decision making. “Additionally, AI and machine learning are providing the tools to process and analyze the increasing amount of data generated by doctors, hospitals, researchers and organizations, including structured data like EHR forms as well as unstructured data, such as emails, text documents and even voice notes,” said Patrick Combes, technology leader, healthcare and life sciences, at AWS. To that end, AWS recently announced Amazon Comprehend Medical, a machine learning service that can help process unstructured data such as medical notes, prescriptions, audio interview transcripts and radiology reports – as well as identify information such as patient diagnosis, treatments, dosages, systems and signs. One example is Philips’ HealthSuite digital platform, a cloud-based trove with more than 21 petabytes of data from 390 million medical images, medical records and patient inputs – giving providers, clinicians, data scientists and software developers access to both quality data and AI tools to deliver a more personalized care experience, he explained. Healthcare providers globally are facing increasing internal and external pressure to incorporate data into their decision making to help improve care quality, reduce costs and drive better patient experience and outcomes. Additionally, there is a growing amount of unstructured data resulting from the shift from structured forms to text and voice notes – driving an opportunity for AI and machine learning. “Processing this data creates a complex, expensive and timely coding process for medical billers and higher dissatisfaction from providers as they are forced to spend more time responding to inquiries to clarify and identify segments of their notes, and less time spent on patient care,” Combes said. Combes added that AWS is seeing significant interest in machine learning and AI across the healthcare industry to help mine both structured and unstructured data in clinical settings. Fred Hutchinson Cancer Research Center in Seattle, for instance, is using Amazon Comprehend Medical to evaluate millions of clinical notes to extract and index medical conditions, medications and choice of cancer therapeutic options, reducing the time to process each document from hours to seconds, he explained. While curating high-quality data can be especially challenging in the healthcare industry, which is plagued with highly complex and unstructured data, it is essential to operate AI- and machine learning-driven data sets, Partovi said. 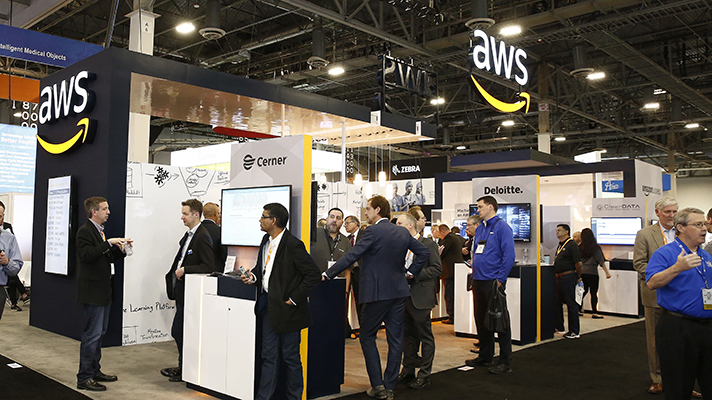 Amazon Web Services will be in Booth 5058.